You’ve pledged to shrink the administrative state. And you’ve worked hard to select, nominate and win Senate confirmation of judges to fill the many vacancies left by President Obama. Yet, Obama and his cronies continue to expand the administrative state and thwart America’s real judges. AND at the expense of American citizens trying to earn a living as inventors. 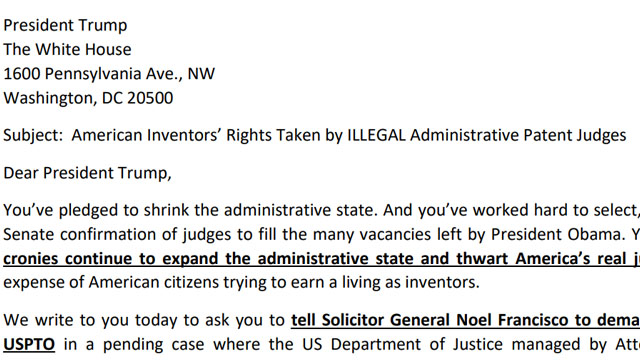 We write to you today to ask you to tell Solicitor General Noel Francisco to demand integrity at the USPTO in a pending case where the US Department of Justice managed by Attorney General Jeff Sessions has asked for an extension of time to figure out what to do about this patently obvious violation of our rights. You alone can swiftly instruct your lawyers to enforce America’s laws starting with the Appointments Clause in the Constitution. The undersigned inventors have suffered loss of our hard-earned patent rights in Patent Trial and Appeal Board (PTAB) determinations by unappointed and unconfirmed Administrative Patent Judges (APJs). Many of these APJs were hired by former Google attorney Michelle Lee while she was Director of the USPTO (2014-2017). They have exhibited a shocking prejudice against inventors, invalidating claims in 85% of the patents reviewed including our own. Most importantly, in carrying out these extremely high stakes decisions, APJs are acting as Officers of the United States but without appointment by the President and confirmation by the Senate in violation of Article II, Section 2, Clause 2 of the Constitution. Polaris argued that the Board’s administrative patent judges are principal officers of the United States. Because administrative patent judges are “appointed by the Secretary of Commerce, in consultation with the Director” of the USPTO, 35 U.S.C. § 6(a), Polaris argued that their appointments violate the Appointments Clause of Article II, and that their decisions must be set aside. Responsibility for deciding whether the United States will intervene in this appeal is vested in the Solicitor General. See 28 C.F.R. § 0.20(c). The decision requires review of the constitutional issues raised by Polaris’s appeals in this case and No. 18-1831 and consultation with interested components of the Department of Justice and the U.S. Patent and Trademark Office. In view of the importance of those constitutional issues, additional time is needed to complete the consultation and review process. The United States therefore requests an extension of time to September 4, 2018. We are very grateful for the attention you have given to correcting course at the PTO and the work that Director Andrei Iancu has initiated to that end. However, there are 1,678 patents, including our own, which were invalidated by the PTAB without proper safeguards. Many of these patents were invalidated by APJs that are former lawyers for frequent PTAB petitioners like Apple – lawyers hired by Michelle Lee without any Presidential appointment or Senate confirmation, and the requisite scrutiny of their qualifications, competency, and objectivity. The Constitutional appointment and consent requirement mitigates cronyism via public bi-partisan hearings. The current procedure has put incredible power into the hands of 270 individuals that are virtually unknown, except that the former head of Intellectual Property for Google was pleased to select them. The little that is known about these APJs suggests there are deficiencies in their qualifications and objectivity, the sort of issues examined and investigated in the Constitutional appointment and confirmation process. Mr. President, we were mugged in a dark alley and no one was there to help us. These APJs wield tremendous power of billions of dollars of patent rights – our main assets and collateral for capital investments in our past and future discoveries. These APJs are principal officers because of the gravity of the decisions on whether we own the rights to our inventions and their decision is not reviewed by any other executive official. For instance, Director Iancu (who was properly appointed and confirmed), may not review these decisions under the relevant statute. Mr. President, please continue the work of restoring faith in the patent system to promote innovation progress. Mr. Iancu cannot give us back those 1,678 patents but Solicitor General Francisco can urge the Courts to do so. Sir, those unaccountable Administrative Patent Judges must not be allowed to destroy billions of dollars investment in our inventions along with the small businesses that many of us had built. Please tell the Courts that the PTAB APJs require Presidential appointment and Senate confirmation in order to carry out this grave responsibility. Mr. President we would be happy to visit with you in the near future about this situation and provide further detail of our businesses, inventions, and experience in the patent system. Thank you for your attention to restoring integrity to our patent system. In addition, PTAB proceedings also deprive inventors of a host of protections including 1) an independent judiciary, 2) a trial by jury on factual allegations, 3) discovery of probative evidence such as copying and commercial success, 4) the right to cross-examine our accusers in open court, and 5) the benefit of a clear and convincing standard of proof.